The year is drawing to an end, so let’s see what’s happening in the fashion world this week! This week in WGSN we are going far into the future of 2020 to look at ‘active.’ This means that wellbeing and all things slightly athletic are still on the cards for a few more years to come! In terms of technology, Artificial Intelligence (AI) will be updated with emotional intelligence so it can perform tasks such as being a workout buddy, which is incredibly cool in my opinion! Socially, there is also a continuation of the ‘do good’ idea, with activism such as veganism on the rise and people having a greater awareness of the environmental issues we face. Why is all this important to fashion I hear you ask? Well, it is important to know of any niches that are in the works so you can take advantage of them early. Printed shirts with wellbeing quotes will most likely have a strong place in the retail outlets. It is also important to note that is it increasingly important to look for sustainable materials so get started now if you want to jump on this ongoing trend. And with the AIs you could always make very cute jumpers for robots – which is going to be my next business idea! The next event that is up is Graduate Fashion Week. Very, very exciting and I’m so looking forward to supporting our uni in the graduate catwalk, which is at 6.30pm on Sunday 3 June. Graduate fashion week begins on that Sunday and continues until Wednesday 6 June so make sure you can join in on one of those days. It takes place in the Truman Brewery, Hanbury Street, London E1 6QR. You can get your free student ticket here. This is a very exciting chance to discover other UEL students’ work and see how massive events like these are run, so come along! Spotted: Chelsie. Where: Outside student accommodation. 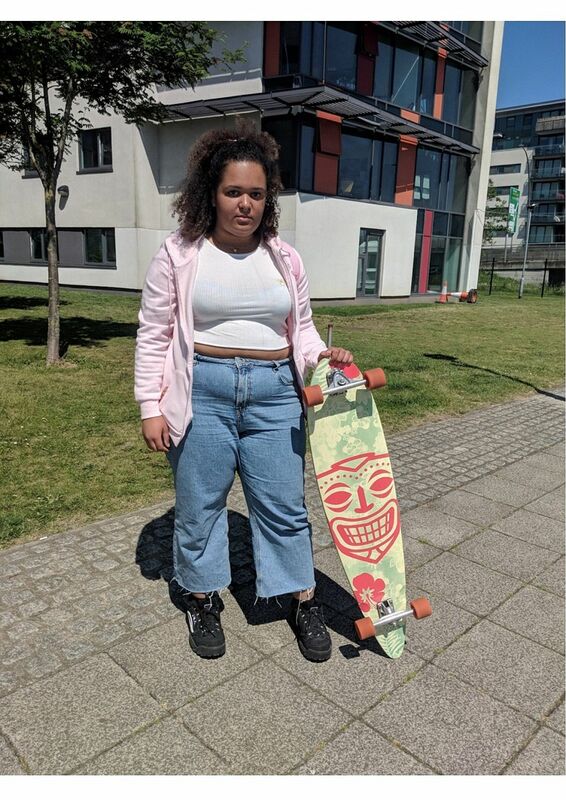 I absolutely love what Chelsie is wearing, especially the long board. The no hem jeans are very trendy right now and aren’t going to go away any time soon. I also LOVE the crop top, mostly because I have the same one but also because it goes so well with the jeans. I adore the hard but soft edge to how she’s put her outfit together. The black shoes really create an awesome clash of textures with the rest of the outfit and this is something that is super fashionable now. I love what she is wearing! This week’s Did it work? of course has to include someone from the Royal Wedding over the weekend and…to avoid being too political… I’ve decided to look at what Amal Clooney wore! Amal wore a lovely yellow dress* with a matching fascinator/hat (which one is it? I’m not sure can someone let me know?). This dress is so simple and it works perfectly with the event. She looks like an actual ray of sunshine and I love the dress and her so much! This is a definite thumbs up from me. *You’re going to have to Google Amal’s dress for yourself as, for copyright reasons, we can’t republish a photo of it here.